Plebiscite 2013, a Venetist group, conducted the referendum between March 16 and 21, and it claims that 2.36 million Venetians voted in the online poll for full independence from Italy, fully 89.1% of the voters who participated. There are good reasons to doubt whether those numbers are accurate — Il Corriere del Veneto today reports that, following an analysis of the web traffic data, the real total is something more like 135,000, and among those voters, there are more votes from Chile than from Padua, one of the region’s largest cities. While you should take the Venetist movement increasingly seriously, the March online poll is not the most credible evidence. A Demos/La Repubblica poll from last week shows that only half of Venetians even took part in the online, non-binding vote. Venetians, according to the poll, would vote 55% in favor of independence (with 39% voting against it), hardly the kind of lopsided margin that the online vote results suggest. Assuming the accuracy of polling data, that means that Venetians are a bit more enthusiastic about independence than voters in Scotland and a bit less enthusiastic than voters in Cataluyna. Scotland will hold an independence referendum, as agreed with the British government of prime minister David Cameron, in September, while the Catalan regional government hopes to hold an unofficial referendum in November, though Spanish prime minister Mariano Rajoy refuses to recognize or negotiate any vote on secession. (Like Spain, Italy’s constitution doesn’t provide for secession, so there’s no immediate mechanism to effect Venetian independence). 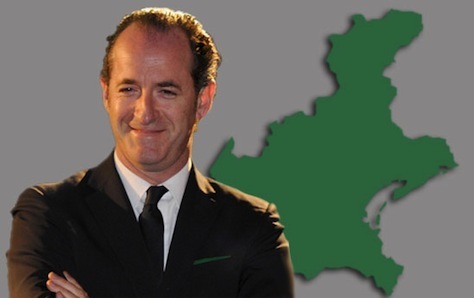 The online poll wasn’t the brainchild of the mainstream Venetist political elite, which includes Veneto’s regional president, Luca Zaia, and Verona mayor Flavio Tosi, but comes instead from the more obscure libertarian/separatist movement headed by Gianluca Busato, a local businessman and Venetian activist. Zaia, though a member of the regional Liga Veneta (Venetian League), itself part of the larger center-right, autonomist Lega Nord (Northern League), has never campaigned on a pro-independence platform. But he seemed to jump on the bandwagon of Venetian independence last week as the online vote began to attract significant attention. Veneto is one of the 19 regions of Italy, and with 4.88 million residents, it’s one of the largest and most populous. It’s also one of Italy’s wealthiest regions. As of 2008, its regional GDP per capita amounted to around €30,500. That’s roughly equivalent to Lazio (the region including and surrounding Rome), and it’s a little less than Lombardy (the region including and surrounding Milan), the economic engine of northern Italy. In any event, Veneto ‘s per-capita wealth is much greater than the Italian national average, due to the relative poverty of Italy’s southern regions. Though the history of Italy’s northern regionalism movement is a bit complex, it’s notable that the Liga Veneta was the first movement of its kind in modern Italian political history. Formed in 1979 for the purpose of promoting the region’s interests and advocating greater regional autonomy, the Liga Veneta joined forces with the Lega Lombarda to form the Lega Nord in 1991 under the leadership of Umberto Bossi, at a time when Italy’s political elite was in collapse. The Lega Nord has been a somewhat unsteady ally in Silvio Berlusconi’s past governments, though it played an increasingly reliable role in Berlusconi’s governments in the 2000s. Though it didn’t accomplish much in the way of transferring greater power from Rome to local authorities, Bossi and the Lega Nord enjoyed (perhaps too much) the largesse of holding power in Italy. In Veneto, too, the Liga/Lega joined forces with Berlusconi’s Popolo della Libertà (PdL, People of Freedom) to govern at the regional level, beginning in 1995 under Berlusconi ally Giancarlo Galan. Ahead of the most recent March 2010 regional elections, Berlusconi and his allies agreed to support Zaia (pictured above), who had previously served as Berlusconi’s agriculture minister, as the presidential candidate of the centrodestra (center-right) coalition. Accordingly, Zaia led the united centrodestra to a landslide victory with 60.2% of the vote, not surprising for a region that tilts significantly to the right. In the corresponding vote for seats on the regional council, the Liga Veneta/Lega Nord placed first with 35.2% of the vote (a swing of 20.5% from the previous election), followed closely by Berlusconi’s PdL (24.7%) and the Democratic Party (20.5%). But the Liga didn’t campaign on a pro-independence platform, and the massive vote swing reflects the decision of the ruling center-right coalition to hand the regional presidency, after 15 years, to the Liga. 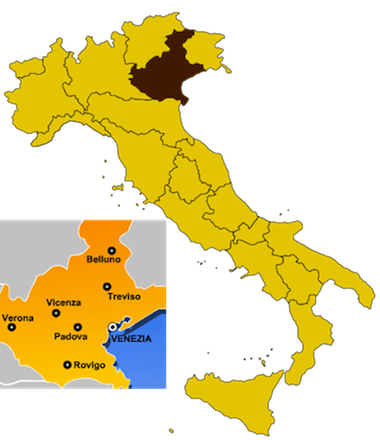 The Liga in Veneto falls into two camps: Zaia’s moderate, business-friendly wing and a more populist, conservative variant that emerged with Tosi’s election in 2007 as mayor of Verona (of Romeo and Juliet fame). Though Tosi’s made some controversial remarks about Roma gypsy camps, neither he nor Zaia have particularly championed Venetian independence. More recently, in the February 2013 general election, the Lega Nord won just 10.9% of the regional vote for the Italian Senato (Senate). That’s less than Silvio Berlusconi’s PdL (the Lega‘s ally in the broader center-right electoral coalition), the center-left Partito Democratico (PD, Democratic Party) that now governs under prime minister Matteo Renzi, Beppe Grillo’s protest Movimento 5 Stelle (M5S, the Five Star Movement) and even the reformist, centrist coalition headed by former prime minister Mario Monti. The three parties campaigning for full Venetian independence fared even more poorly. Indipendenza Veneta won 1.1% of the vote, Liga Veneta Repubblica won just 0.7%, and Veneto Stato won 0.3%. That’s hardly the kind of showing you would expect from a region frothing with secessionist sentiment. But that doesn’t mean that the latest surge can’t grow on the basis of its own momentum. Four decades of calls for greater regional autonomy haven’t amounted to any real decentralization of the Italian state, despite a 2006 constitutional referendum that offered a grab-bag of reforms, including the devolution of more power to Italy’s regions. Like the supporters of Lega Nord in the regions of Piedmont, Lombardy and elsewhere in northern Italy, Venetians resent the resource drain of the Italian south. Veneto, with its distinct Venetian dialect and unique republican history, has as strong a claim to independence as any other Italian region. In the era of the great city-states of the Italian peninsula, none shone quite so brightly as the Serenìsima Repùblica Vèneta, the Most Serene Republic of Venice, or just La Serenissima. At its height, the Republic included not just the city of Venice and its hinterlands (which today includes not only Veneto, but the neighboring Friuli-Venezia Giulia region), but much of the Dalmatian and Istrian coast in what is today Croatia, parts of Greece, including for a few decades, the Peloponnese, and the islands of Crete and Cyprus. This is the Venice that gave the world great explorers like Marco Polo, that spawned the music of Antonio Vivaldi, that produced painters like Canaletto, Carpaccio, Tintoretto, Veronese and Titian. From its local origins in the final years of the 7th century, Venice emerged in the Middle Ages as a wealthy hub of European trade and seafaring commerce. Throughout the millennium-long history of the Venetian republic, it employed a unique system of proto-democratic rule, with the Venetian oligarchy electing a ‘doge,’ essentially the republic’s chief magistrate, at regular intervals. In the 14th century, Venice reached the apex of its power after defeating the rival city-state of Genoa, making Venice the undisputed maritime power of the Adriatic, Aegean and eastern Mediterranean Seas. Venice’s growth often brought it into conflict in later years with the Ottoman empire, and by the end of the 18th century, Venice’s naval and economic prowess was in decline. In 1796, the French army, under the command of Napoleon Bonaparte, occupied Venice, and brought the Republic era to an end, as Napoleon ceded what was left of the Venetian Republic as an Austrian possession a year later, beginning a new era of Hapsburg rule. During the Risorgimento, the unification campaign headed by the Piedmontese monarch, Victor Emanuel, and Giuseppe Garibaldi and Camillo Cavour, Venice was absorbed into Italy following a sham referendum in 1866. Venetian enthusiasm for Italian unification was middling at best, especially in contrast to the administrative competence of the Hapsburg government. When Venetians revolted against Austrian rule in 1848 and 1849, just a few years earlier, it was to reclaim Venice’s independence as a republic, not to join a nascent Italian kingdom. None of this was destined to happen: Venice had endured too long to be ranked as one with Nineveh and Tyre…. The Republic of Venice survived 1,100 years with no pillaging and no capture until it succumbed to Bonaparte; at no time had its government been overthrown. In 1797 it was a state in decline, certainly, but it need not have fallen much further. It might have recovered (like the Netherlands), it should have regained its independence in 1814 (like the Netherlands) and today Venice could have been (like The Hague) the capital of a successful small country inside the European Union. Its incorporation into the kingdom of Italy — which its people did not want — was almost as much an aberration in its history as its forced membership of the Habsburg and Napoleonic empires. With an increasing number of European regions considering independence, such as Scotland, Catalunya, Euskadi (the Basque Country), Flanders and perhaps others, and with the aegis of a growing European super-state, the dream of a 21st century Venetian republic might not be so far-fetched. But it’s not going to happen on the basis of one flawed online poll. 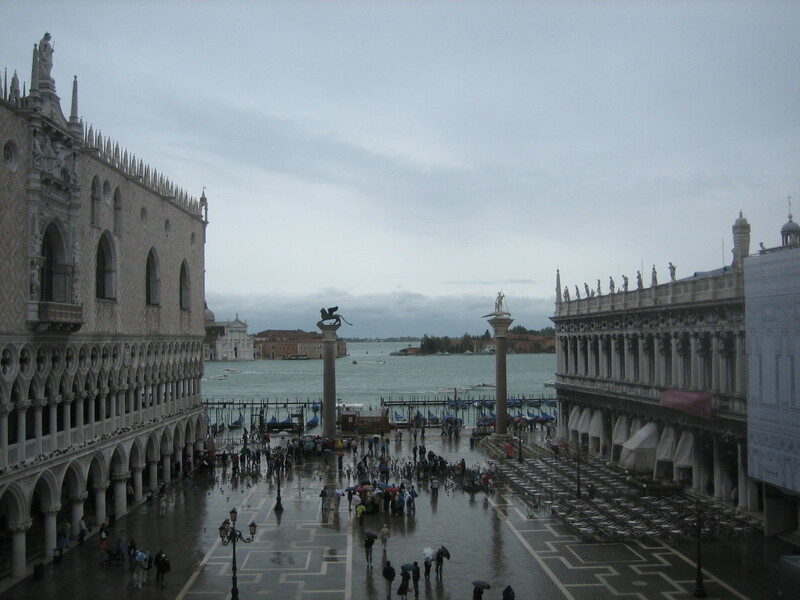 Top photo credit to Kevin Lees — Piazza San Marco, September 2005.